The most hotly awaited report of the year about who Hollywood puts on screen is out, and it looks grim. Every year Dr. Stacy Smith’s Media Diversity & Social Change Initiative at USC Annenberg drops the most comprehensive study on the representation of women on screen each year. Their work is herculean: They look at the top 100 grossing films of the previous year — in this case, 2015 — and then set about to code gender, race, LGBT status and other demographic information about every single speaking character in every single top-100 film. While there are plenty of ways to take a stab at analyzing gender in film, as far as completeness goes you can’t beat the MDSCI report. In 2015, the MDSCI found that 31.4 percent of the 4,370 speaking characters analyzed were female1. 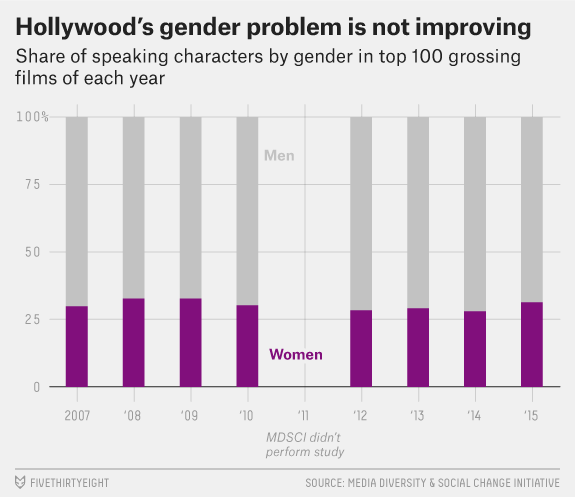 While this is an increase from 2014 levels, when 28.1 percent of speaking characters were female, it’s still lower than levels in 2008 and 2009. But really, come on, men outnumber women more than 2-to-1 on screen. That’s a total absurdity. Only 32 percent of the movies had a female lead or co-lead. A mere 12 percent had a gender-balanced cast. 49 percent didn’t have an Asian character, 40 didn’t have a Hispanic or Latino character, and 17 didn’t have a single black character. In 2015, there were only 19 gay, seven lesbian, five bisexual and one transgender characters in the top 100 films, out of 4,370 speaking characters. You can and should read the full report for more findings like those. You may recall that last year one of the highest-grossing films of the year was a little picture called “Minions,” in which the Minions characters from “Despicable Me” were spun off into their own franchise about their civilization, which is entirely composed of Minions. So in order to build this report, think about this: Some poor researcher had to watch the “Minions” movie — stopping, restarting, rewinding to place each voice — to code it for the project. This took hours. She had to discern the Minions from one another. She had to identify core facts about the Minions. She had to file a report about the Minions. This research had to happen three different times. It had to be cross-checked by a fourth researcher! “We never want to inflate a number or double count, so they represent a challenge,” said Choueiti about how the team coded “Minions.” This involved an “extra document detailing scrupulous notes on the Minion’s eyes, size, tufts of hair on their head [and] their clothing.” In the end, the MDSCI probably has a better reckoning of the Minion speaking population than Illumination, the studio that made the cursed movie. Without MDSCI’s effort, we wouldn’t have such rock-solid evidence that there’s a fundamental problem in the film industry’s treatment of women, nor would we know that things aren’t even getting that much better. So if you meet a USC media researcher in Southern California who can’t stand the color yellow anymore, buy them a drink or something. I say “female” rather than “women” only because we’ve got to be comprehensive here: talking animals are a mainstay of film, as are young girls and assorted nonanthropic individuals, you know?